Samantha and Chris were the perfect couple to shoot with for their engagement photography session. They were so affectionate, comfortable and so visibly in love, it made my job easy. I just had to sit back and capture these two simply enjoying each other. I think it all shows in their images. 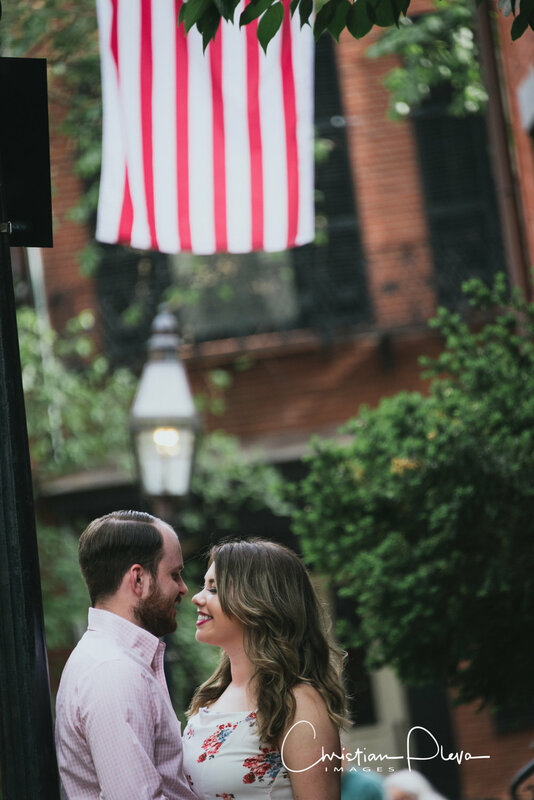 Here are a few sneak peeks from our session together in Beacon Hill, as well as a few words about their story from the couple! I'm a flight attendant and at that time I was based and living in San Francisco. Chris was half way through his first year at Suffolk Law School. I had a layover in Boston, so the crew and I decided to go to Champions to watch the Broncos/Patriots AFC Championship game. We found standing room at one of the bar tables since the whole place was packed. Chris and his friend were sitting at that same table. We were all hungry and trying to find out what was good on the menu. Chris told me anything but the burgers were good. He was wearing a Pats hat so I of course started to talk smack about football with him. We ended up hanging out with the whole table of people after the game. Chris and I exchanged numbers then a month later I came back to Boston to watched the Super Bowl together. Summer came and went. I never thought a relationship would happen because we of course lived on opposite coasts. I had received a parking ticket and was trying to find out my legalities in my situation. I was thinking of who I knew that was a lawyer and immediately thought of Chris. We talked about what I could do then Chris told me I should come back to Boston so he could take me out on an actual date. So, I decided to pick up another trip to Boston. We went to my first Red Sox game and the rest was history. Six months later I put in my transfer to the Washington base and moved across the country to our first apartment in East Boston. I always take Chris on layovers any chance we can get. I decided to pick up a Paris trip since he had never been. He was really stressing out about the probability of not getting a seat on the flight. I kept telling him to relax and that he can always come another time. I had no idea he was planning to propose to me. He ended up making it on the flight. I worked the red eye flight so we arrived in Paris early the next morning. Instead of getting some sleep, Chris and I met up with the crew and decided to head straight out to explore. It was supposed to be raining all day so our first stop was at the Louvre where we walked and got lost on multiple floors trying to find the Mona Lisa. After we finally found the painting I wanted to get a lock to put on the Pont des Arts, also known as the love lock bridge. I realized I had no Euros to get a lock at one of the little kiosks, so we had to find an ATM. It started to rain on the way to the ATM and felt like we were never going to find it. We finally found one and went back to get our lock. It was a small golden lock that we wrote our initials on with a sharpie. We found the rest of the crew and got them to take pictures of us with our lock. I was showing one of the girls from the crew how to take a "boomarang" on Instagram so we could get one of us throwing our keys into the river. As I walked away Chris whispered to her that he was going to propose. He came back and got on one knee. There was a man playing the accordion while everyone on the bridge clapped as i kissed him and said yes. As soon as I wiped all my happy tears the sun came out and turned into a beautiful sunny day. I called my parents, of course they already had been waiting for me to call, and then we strolled through the Latin Quarter stopping at various restaurants to celebrate with bottles of Rosé. We are mostly excited for the location. We love Jacksonville and I can't wait for all our friends and family to visit and have a great time. We wanted an intimate setting but beautiful location. Since Boston has meant so much to us in our relationship we figure around acorn street would be perfect area. Have fun with it and relax. You don't want to be stiff in your pictures. Be excited! I mean you fell in love that's what this is all for! We had so much fun in our session. Chris always knows how to make me laugh, but it was fun when Christian would laugh along too. Christian makes you feel very comfortable in front of the camera and has great tips on how to pose.